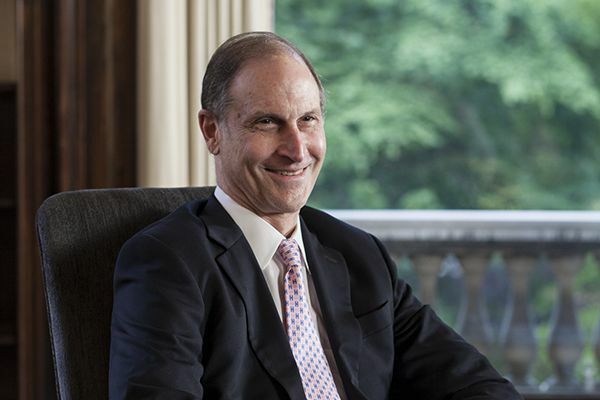 David Blumenthal, M.D., M.P.P., is president of The Commonwealth Fund, a national philanthropy engaged in independent research on health and social policy issues. Dr. Blumenthal is formerly the Samuel O. Thier Professor of Medicine at Harvard Medical School and Chief Health Information and Innovation Officer at Partners Healthcare System in Boston. From 2009 to 2011, he served as the National Coordinator for Health Information Technology, with the charge to build an interoperable, private, and secure nationwide health information system and to support the widespread, meaningful use of health IT. He succeeded in putting in place one of the largest publicly funded infrastructure investments the nation has ever made in such a short time period, in health care or any other field. Dr. Blumenthal received his undergraduate, medical, and public policy degrees from Harvard University and completed his residency in internal medicine at Massachusetts General Hospital. With his colleagues from Harvard Medical School, he authored the seminal studies on the adoption and use of health information technology in the United States. He has held several leadership positions in medicine, government, and academia, including senior vice president at Boston's Brigham and Women's Hospital and executive director of the Center for Health Policy and Management and lecturer on public policy at the Kennedy School of Government. He served previously on the board of the University of Chicago Health System and is the recipient of the Distinguished Investigator Award from AcademyHealth, an Honorary Doctor of Humane Letters from Rush University and an Honorary Doctor of Science from Claremont Graduate University and the State University of New York Downstate. How did you first become interested in medicine and internal medicine/primary care? I had many interests as an undergraduate and medicine was one of them. I was actually a government major when I was an undergrad and was interested in public policy. I was also interested in journalism and writing and was active on my undergraduate newspaper, the Harvard Crimson. I did however, take the minimal number of courses required to get into medical school. I have since continued to see patients for more than 35 years. I took up primary care because it seemed to be the most flexible of the specialties. There was also a primary care internal medicine program at Massachusetts General Hospital and I wanted to remain in Boston because at the time my wife was a Psychiatry resident there. Can you share your background on how you got to where you are right now? During my medical school training, I got a Masters in Public Policy at Harvard’s Kennedy School of Government. I also wrote a newsletter during medical school on Health Care Policy which I published and distributed through a mailing list. Public Policy was my avocation throughout medical school. Through contacts at the Kennedy School, I had the great opportunity to work on the professional staff of the late Senator Edward Kennedy. This occurred during my house officer training, which I left to work for nearly 3 years on Capitol Hill. I then came back to Mass General and finished my residency and took my boards in Internal Medicine. By then, I had acquired a pretty deep experience on healthcare policy issues through my academic training and my work in the senate. I also built a deep understanding of policy issues and legislative process. After finishing my residency, I then began to work at the Kennedy School, where I was a fellow and then became a member of the faculty. I spent seven years there teaching health policy and doing research. That added another layer of scholarly development and policy expertise for me. My experience at the Kennedy School sensitized me to the importance of management and management skills in public policy – for example, in managing large public agencies. So I wanted to try out management and develop some management skills. So I eventually left the Kennedy School to try out management and served as Senior Vice President of Brigham Women’s Hospital. When Michael Dukakis, who was actually a member of the Kennedy School’s Faculty while I was working there, ran for president, I was a health advisor during his campaign. I stayed at the Brigham and Women’s Hospital for 4 years. At that time, my wife, for professional reasons wished to stay in Boston, and I realized that for a career in management I needed to be able to move around a lot which wasn’t feasible for my wife. As a result, I went back to Academics and started a health policy research group at Massachusetts General Hospital. I continued to write papers and grants and lived a soft-money research life from 1992 to 2009. In 2007 I worked on the Obama campaign basically from the time he announced through the general election. Then in 2009, I worked in the new administration as the national coordinator for Health Information technology. Throughout my time at the Kennedy School and 20 years running research groups at Massachusetts General Hospital, I continued to do primary care about a day a week. My career was a mixture of academics, management, policy, development, clinical care and teaching. What was it like serving as a Senior Vice President of a Hospital? I was a Senior Vice President for a few years and my role consisted of mostly corporate functions. I ran the media relations, development, legal, technology transfer, and planning groups. After a few years, I took on operational roles with responsibility over the pharmacy, radiation therapy, psychiatry, and social services groups. I combined operations with corporate management during my time. I also took on my own efforts in quality management because at the time, quality and safety weren’t considered a big issue in hospitals. Can you dive a bit into the Common Wealth Fund? What type of work are you doing there and what are your goals as president of the organization? I’m responsible to the board of directors for the functioning of the foundation. That means making sure it continues to be productive, moving us toward our goals, ensuring that we have a strong productive culture, and a strong productive talented workforce at the Fund. I work to make sure we are managing our grants productively and we provide our stakeholders what they want from us. I also make sure that the quality of the work we do, the quality of what we publish, and the data we produce and publish are up to our standards. Finally, I am responsible for the management of our endowment and maintain and support the board of the organization. It’s a Combination of management, academic, and leadership roles. I am the face of the foundation to a large degree to the outside world and I try to make myself visible in the right places and communicate the key messages and findings that the Common Wealth Fund develops. I also dedicate time to the ethical standards within the organization, ensuring we maintain our integrity and remain compliant with federal and state laws. What are your thoughts on the Affordable Care Act, and what policy changes do you think the United States has to undertake with regards to its current healthcare system? It has reduced the number of uninsured Americans dramatically and has made insurance available and affordable to previously uninsured people and provides a higher quality of insurance to give people more protection against the cost of illness. There are 25 MM more people receiving insurance under the ACA. People are getting care they haven’t had before and they are satisfied by their insurance and the care they are getting in both primary and specialty care. Therefore on the access and affordability side, the law has made progress. It’s still early to talk about the ACA’s effect on quality and cost of care, but there are some positive indicators in those areas, but their link to the ACA is still unproven. If you want my complete treatment of my views of ACA (Insert Link to New England Journal). Even if the ACA is fully implemented, there are still significant gaps. The ACA will leave 20-24MM American uninsured. A lot of those are undocumented or here as guests in one form or another and might not be eligible for insurance. Many of these are poor and live in states where Medicaid hasn’t been expanded under the provisions of the law. In particular, there are people with incomes within a certain range who aren’t eligible for traditional Medicaid. Incomes that are too low to get subsidies on the ACA exchanges and too high for Medicaid. Furthermore, more work needs to be done to make primary care attractive. With Medicare and Medicaid, ACA boosted primary care income in the short-term but this needs to expand. There’s a large agenda in healthcare delivery system reform which is enabled by the ACA, I don’t think new authorities are needed but governments need to fully capture and use the authorities available to them under the law. They are making the effort but there’s a ways to go. How can technology be an enabler in improving healthcare in the US? There are many ways. Now that data on patients is increasingly available in an electronic form, it should be possible to develop more powerful decision support for providers. You can make doctors much smarter and better informed using technology. Medicine is more powerful when decision support is layered on top of all this information, so that it can be filtered and organized and presented to clinicians in a way that makes sense and doesn’t require them huge amounts of time to manipulate themselves. On the provider side, decision support and information exchange is critical. On the patient side, it’s a matter of time before all patients who want it, have personal healthcare records complemented by digital health assistance of one kind or another, all based in the cloud, with lots of software to take personal records and translate them into information that patients can use to make decisions about their own care. It’s also to better understand what’s going on with their health. There will be all kinds of ways for healthcare professions and patients to interact with remote monitoring and patients contributing data to their personal health records. We are just scratching the surface and in 20 years, medicine will be drastically different. Fifty years from now it will be unrecognizable. The circumstances of medical practice are constantly changing. I don’t think anybody should go to medicine unless they are able to tolerate change and be able to be flexible in the terms conditions and situation of practice. I think it’s going to be a very dynamic field because of the information available and pending technological transformation. Medicine is all about information, information is the lifeblood of medicine, and is among the most precious resources and the most important enablers of effective practice. In your lifetime you will have to bob and weave with that process of change. This change process will be faster than it has been in my career. Once information is in digital form, the opportunities to manipulate it for different purposes are enormous. Robotics will have a huge effect on medicine as well. This includes robotic surgeries and procedures of all kinds. Artificial intelligence will also become routine in your lifetime, and many activities that fill physician’s days will be open to automation during your lifetime. A lot of medicine will be practiced remotely, at a physical distance from patients. People will do a lot of things themselves that doctors used to do for them. This will all be possible because information can unlock healthcare and the digitation of this information can potentiate these changes. At the same time, there will always be a need for health professionals because patients can’t know and interpret everything. They will still benefit from having wide and experienced advisors assisting them with decision-making. Physicians will therefore, be more active in the non-procedural realms as advisors and decision makers. In the procedural spaces there will be so much interaction between human and machine that day-to-day work of many procedural specialties will also be different than it is now.